After the spiritual highs of a Christian retreat, it can seem like the rest of the year is spiritually downhill until the next conference or retreat. But what if there was a way to help make your faith life defy this downward spiral? What if you could leave the retreat and watch your spiritual life increase over the following year? Here, youth pastor Bob Wallington practically sets out how you can make your faith come alive once you're back into the regular routine of school, homework and church on Sundays. In bitesize chunks, Bob explores ways of reading the Bible, taking time to reflect on God, asking for prayer, developing a prayer life and getting involved with church. Filled with positive feedback from young people who have tried Bob's methods, he challenges the idea that your faith life doesn't have to get worse once the conference is over  it can get better! Bob Wallington is the youth pastor at Soul Survivor Watford. Growing up within Soul Survivor church, he is well-known within the church community and on the summer conference scene. Prior to this, Bob was Director of OneLife, an organization which trains and develops young leaders and holds yearly conferences across the United Kingdom. 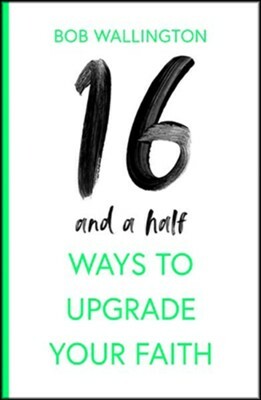 I'm the author/artist and I want to review 16 1/2 Ways To Upgrade Your Faith.